I had only watched through this movie once the very first time I saw it on opening night, but it was memorable enough for me that I remembered a lot on the re-watch. A lot of people that I know on Twitter and Facebook loathe this movie with a passion for so many reasons. They don’t like Tom Holland as Spider-Man, they don’t like that it doesn’t directly address the Uncle Ben story that we’ve seen at least twice in live action movies and they hate that Iron Man is even in it and that he gave Peter Parker a tricked-out suit to wear with an overabundance of features. To each their own. I love this movie and still consider it to be the best of the live-action Spider-Man movies to this point. To be clear, I am a fan of the first two Tobey Maguire-led movies directed by Sam Raimi and the first Andrew Garfield-led movie directed by Marc Webb, so this isn’t a case where I was disappointed with the previous Spider-Man actors or movies. On the contrary, I’ve seen them all at the theater excitedly. I’m also not someone that was waiting for Spider-Man to join the Marvel Cinematic Universe just because I wanted to see him fight alongside the Avengers, so I had no vested interest in that either to say that I like this movie. The reason I think Spider-Man: Homecoming is fantastic is because it’s a “real” movie in my opinion. What I mean by that is that a lot of times a comic book movie, especially ones in the MCU, are centered around stories that are so fantastical in nature and structure that they don’t stay on the ground much at all with anything relatable to real life. They don’t have to do that considering the nature of their existence, but it’s really nice when they do, and this is a case where a movie absolutely does and it’s even better that it’s Spider-Man. In fact, Homecoming is arguably the most “grounded” movie in the entire MCU to date. This isn’t a world-ending threat level story like in any of the Avengers movies or Thor films. This is a very personal story regarding Peter’s life after his brief stint with the Avengers in Captain America: Civil War. He’s keeping it low-key and being a “friendly, neighborhood Spider-Man” while waiting for Tony Stark to call him back for another Avengers level mission. In the process, he finds a working class-level threat in Michael Keaton’s Adrian Toomes AKA the Vulture, a man whose salvage operation to feed his family involves building weapons out of alien scrap from previous Avengers incidents and selling them on the black market to the highest bidder. So, it’s a localized threat but still severe enough that an Avenger probably should handle it, except Tony Stark and Happy Hogan are doing their best to ignore Peter Parker at every chance he gets to warn them about what’s going on, leading him to investigate it himself in order to do the right thing and also prove that he’s worthy of being an Avenger. One of the best things this movie could have done was limit the presence of Stark and focus it as much on Parker as possible and not only did they do that, but they also allowed his classmates from Midtown High School to lead the way with him and made the movie a coming of age teen story, reminiscent of 1980’s Brat Pack movies. 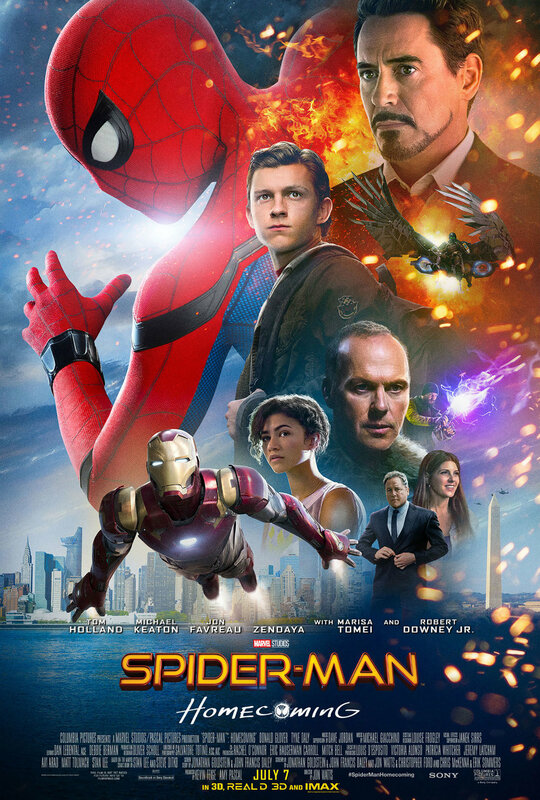 It works, it really works because they trusted Holland, Jacob Battalon who plays Ned, Tony Revolori who plays Flash Thompson, Laura Harrier who plays Liz and Zendaya who plays Michelle to drive the grounded aspects of this movie and really tell a story of a kid in high school who is balancing his life growing up with the responsibility necessary to be a superhero. It’s a different angle than we’ve seen before with Spider-Man on the big screen but I’m glad they did it instead of just giving us another version of the origin story with Uncle Ben dying. You really couldn’t do that here with him being introduced in Civil War anyway, but it’s a happy circumstance for someone like me that was glad to see something new. The other amazing thing they did was casting Keaton as Toomes and writing him as a sympathetic working-class stiff that had resorted to crime to keep his family solvent. This is the exact opposite of a one-dimensional bad guy or a plot device villain as we are introduced to him first in this movie before even seeing Peter and we get a great look at his motivations, his conflicted nature and ultimately his convictions about his actions. It’s a masterful job by Keaton who is in his prime form here, especially in the climactic scene where he and Peter discover each other’s identities. Brilliant. This is a broken record, but more strong VFX and another great score from Michael Giacchino, who designed a theme for both Spider-Man and Vulture that is used throughout this movie to great effect. It definitely gave the film the properly fitting tone and just added to what was already a strong entry for the MCU. Phase 3 has been the biggest recipient of the Tonal Turn in the MCU by far and the dedication to humor is more than present here, but this is another where it fits well with the story and is understandable given the characters in it. You’re dealing with high school kids so high school humor is the right thing to have. Michelle was by far my favorite in that department. Every joke she had was on point and well-timed, especially giving Peter the finger when he walked into the Homecoming dance. This is another one of those MCU movies that I will gladly defend just like Iron Man 3 because I think a lot of the hatred for it is irrational and purist. As always, people are allowed to feel however they want to feel about these movies because it is all subjective, but in my opinion, people should relax about being so down on this Spider-Man movie as though it ruins the Peter Parker mythos. It really doesn’t and in my opinion, it very much adds to it. Overall, one of the MCU’s finest efforts. We’re nearing the end now. Headed to Asgard next for the movie that might have been the most affected by the MCU’s Tonal Turn.